June 20 in Italy is the first day of school exams for the baccalaureate. But perhaps not everyone knows that among the many students, there was a person that we know very well: PIERO. PIERO BARONE TESTS TO GRADUATE. FOR THE ARTIST OF IL VOLO THIS MORNING FIRST ITALIAN TEST AT THE FEDERICO II OF NARO INSTITUTE. Promises are promised and those made to parents must be honored and maintained. For this reason, this morning, Piero Barone, voice of the musical group of “Il Volo” at the age of 25 will sit between the benches of the technical and commercial institute “Federico II” of his country, Naro, to support the first test of Italian in field of the 2018 graduation exams. School that depends on the Institute Galileo Galilei of Canicattì led by the head teacher Professor Vincenzo Fontana. Objective of the artist from Agrigento, – as the newspaper La Sicilia writes today – obtaining the diploma of maturity in Administration, Finance and Marketing, address to which he was regularly enrolled, concluded the junior high school, but who had to leave to devote himself to music with tours and commitments that in recent years have brought him to every part of the world. These days, those who know him well, told of Piero engaged in books and exercises. In short, struggling with a pre-exam tension like that experienced by millions of Italian students. But that morning, there is to bet, many tried to capture this event. Many would try to capture selfies, photos, dedications. However, it was necessary that the commission made sure that didn’t happen. Piero did the first two written tests, then on Friday, June 22 he reached Sorrento for the Agnes Award and while he was in the car, he was studying for exams. Monday 25 he hd the last written test and then will have to do the oral exam. In fact, Piero has published on the official fan club a video where he talks about the exams, unfortunately the video and the translation cannot be published, otherwise I would have added it. But the translation of the video to you I can give. Read it, it’s so sweet…..
Hi fan club friends, how are you? As you well know, this year among the work commitments, I managed to take the exams to take the diploma. I did the first two exams. At the first rehearsal, I made the topic about the Constitution, and I think it was fine. The second test, Business Administration, was much more difficult, but we did a team work with the class and we succeeded (maybe it means that the students helped him). Now I’m in the car, I’m going to Sorrento for the Agnes award, which will air on June 27th, and I’m studying for the oral exam. I’m going home in a couple of days for the third test, I’m getting ready for that too. Now I’m reviewing French but I do not understand anything (he says a sentence in French) is difficult, but I will, I will let you know. I to the oral test harbor “the collapse of the Wall Street stock exchange”, interesting. Well, bye guys, I’ll update you. A kiss!! But I don’t understand why I see you always active in the fan club? Every time I enter the fan club, it tells me that you are online to be able to chat. But I sent you two questions but you never answered, so I thought it’s not true that you’re online. What to say, Piero is an extremely kind person, sensitive, serious, and I would also say very humble. I do not know how many people in his place, already famous, would have faced this type of examination, in a public institute. Bravo Piero, I respect you even more. I believe your parents will be very happy that you have kept your promise. “In bocca al lupo” (into the mouth of the wolf) is an Italian idiom used in opera and theatre to wish a performer good luck prior to a performance. It is equivalent to the American actor’s wish “Break a leg”. The expression reflects a theatrical superstition in which wishing a person “good luck” is considered bad luck. On June 23rd, the guys took part in the PREMIO BIAGIO AGNES event which took place in the beautiful BORGO MARINA GRANDE, a seaside village in Sorrento. This award celebrates 10 years of activity and is given to journalists who uphold the dignity and function of journalism. 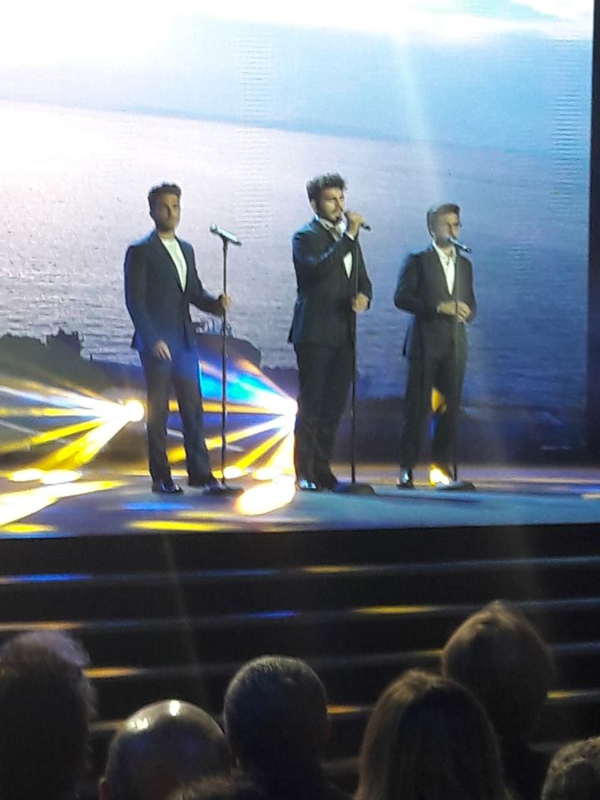 The award ceremony was attended by several guests with performances, and among these, IL VOLO. Here are the guys during the rehearsals, Gianluca is missing because he could not get to the tests in time, because of the traffic. How wonderful, I cannot think of a better song than CARUSO to be performed in the Neapolitan Gulf. Some photos from those lucky enough to meet the guys. I know, RoseMarie Paliobes, you were in Sorrento all day and you did not meet them !!! It’s so frustrating, is it not? And here we are in the evening, the boys are ready, the evening and the type of award requires sobriety and the boys wear elegant men’s suits. There are no official videos because the show will be broadcast on Wednesday, June 27th on RAI 1, so there are only videos made by the public. For now let’s be content with these. They also sang GRANDE AMORE. And here is a beautiful article on the evening and that Mr. Ercole Ginoble immediately shared, I think with great pride. They had already been in Marina Grande at the beginning of their career, when they had not yet become one of the most popular Italian music groups in their homeland and in the world. So, yesterday evening, the three members of “Il Volo” took advantage of the final ceremony of the Agnes Prize to visit again the seaside village of Sorrento and the restaurant “Da Emilia”, an authentic temple of gastronomy on the Amalfi Coast. And it was enough for the fans, including the staff of the club, to recognize them and go into delirium. Piero Barone, Ignazio Boschetto and Gianluca Ginoble were guests of the final evening of the Prize which, recorded last night in Marina Grande, will be broadcast on RAI Uno on the second evening of Wednesday. Together with them other stars of Italian music such as Ermal Meta and Dodi Battaglia, without forgetting the team of dance masters of the TV show “Dancing with the Stars”. The recording of the TV program has offered the trio, winner of the Sanremo Festival and third place at the Eurovision Song Contest in 2015, the chance to return to one of the symbolic places of Sorrento and the Coast: Marina Grande, also famous for hosting the filming of a cult film like “Pane, amore e …” by Dino Risi. And just as Vittorio De Sica and Sophia Loren used to play in the film dating back to 1955, Piero, Ignazio and Gianluca enjoyed a moment of relaxation in the trattoria “Da Emilia”. For them dinner based fried anchovies and marinades, grilled fish and tomatoes “crowned” in the end, by a regal lemon delight. As soon as they entered the club, where they had already been in the past with their respective families and then on the occasion of the Caruso Prize, the two tenors and the baritone aroused the enthusiasm of the fans seated at the table as well as the local staff. Including Irene Cacace, the queen of local cuisine and historical memory of the village of Marina Grande, with which they were immediately photographed. And then, it comes midnight and need to celebrate Piero. What to say, must have been a fantastic evening for those who could be present. The guys were impeccable, elegant, and as always very good, and the Neapolitan public reacted enthusiastically. Too bad not to be there, what do you say? Congratulations on turning a quarter of a century old. We wish you many more filled with lots of happiness. Hi Piero. Wishing you the happiest of birthdays! with those people dear to you. Thanks for another year of beautiful music 🎼, and I am looking forward to next year’s tour. I wish you the happiest of Birthdays. May God bless you and keep you in all your work, and travels. Thank you for sharing your beautiful voice with the world, but especially for being an inspiration to all the young people who love opera and the bel canto. When you make your operatic debut, no matter where it is, I will be there to cheer you on after every act. My Dear Piero :Time marches by very quickly!! Here you are celebrating a milestone birthday #25. Was it not that long ago you were a young teenager spreading your wings on an international stage?You and your fellow Il Volo Brothers are an inspiration to all. Looking forward to seeing you in concert again and listening to that beautiful voice ! Have a great 🎉 Birthday!! Buon Compleanno 🎂🎂Annette Naples, Fl & Narr. R.I.
ma poi se occorre, diventi serio, riflessivo, impegnato. e non ti preoccupare di chi non ti merita. e il mondo ti onorerà sempre!! we wish you the best birthday ever, full of love, laughter and a tremendous amount of fun. You give your audience so much happiness and pleasure, and we are very aware of the work and dedication that is involved . The results are magnificent . I have to listen to your music every day, I love it so much and it always makes me feel happy. I wish for you a day filled with love and laughter and music and joy! Thank you for all the love and laughter and music and joy that you have brought to us! Happy Birthday, dear one. We love you. An American, Martin Luther King, is famous for his speech, “I have a dream”. Piero, did you have a dream? Could you even have dreamed you would be where you are today at 25? Courage, dedication, and talent made this life beyond your dreams come true for you. It has also been a dream for those of us lucky enough to wish you yet another happy birthday. I have been fortunate enough to wish you six of them. Hanno un compleanno meraviglioso, Piero! Bless you for all you do, and all you are! You are a very special person and I wish for you all the blessings that life has to offer! Can’t wait to see and hear you again soon! Have fun celebrating with family and friends! Piero, Wishing you a Birthday filled with happiness, laughter and wonderful memories! Another candle on the cake! More hugs, kisses and lovin’ wishes too! Have a wonder filled and very happy birthday! Have a wonderful day celebrating with Family & Friends! May all your dreams & desires for the rest of the year be fulfilled! Your voice is so beautiful! It continues to gain strength & power! I love any song you sing! Thank you for the pleasure & enjoyment your beautiful music brings to me! 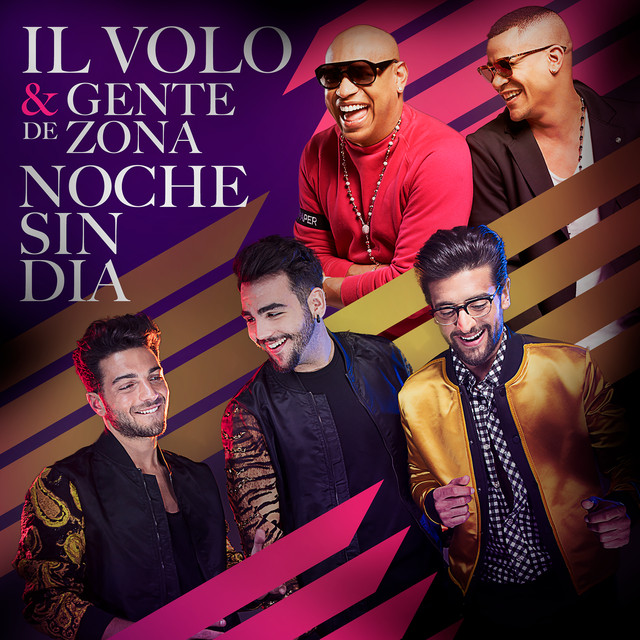 I love the new video, Noche Sin Dia Gente de Zona. Great Latin rhythm!! Again, let me thank your parents for sharing their precious Son with the whole World!! Sending hugs and best wishes for a wonderful birthday filled with much love, peace and joy. Looking forward to more beautiful music and concerts in 2019! God bless you and keep you, your family and friends. Many happy memories on your 25th birthday! I wish for you a wonderful, fun-filled day with family and friends. And, I thank you so very much, for your willingness to share with the world, and me, your exquisite voice. Continue to work hard, and remain the kind, generous and considerate man you are today! You are and always will be a bright shining beacon of light in this world. Your singing brings a joy that is hard to describe to all who hear you. Your kindness and sincere personality warm every heart who have ever had the pleasure of meeting you. You have such a brilliant future ahead of you. I feel privileged and honored to have met you several times. You are truly a genuine human being. Happy birthday and may you enjoy many years to come! Happy Birthday Dear Piero. You are such a special young man. Stay that way and never change. Enjoy your day to the fullest. Happy quarter century! Tanti auguri! Happy “25th” Birthday Piero !! Today we are celebrating 9125 days of amazing you !! Thank you from the bottom of my heart for enchanting us with your breathtaking voice, gorgeous smile and big, beautiful heart !! Have a GREAT birthday and a year ahead filled with all that your heart desires !! Sending you big hugs !! On May 9th Piero was very busy. The GIRO D’ITALIA, stopped in Agrigento, and who lives near Agrigento? PIERO. For those who do not know what GIRO D’ITALIA is, it is a cycling race in stages, very renowned internationally. This year the race started on May 4 from Jerusalem. On Wednesday there was the fifth stage, starting from Agrigento. And here’s who was at the start, who congratulated the cyclists. Piero says that the Sicilians have a unique way of welcoming people and cyclists will not forget this stage. And here is Piero in the company of our esteemed Marino Bartoletti, who is an excellent sports journalist. And here is the video of Bartoletti’s interview with our Piero. 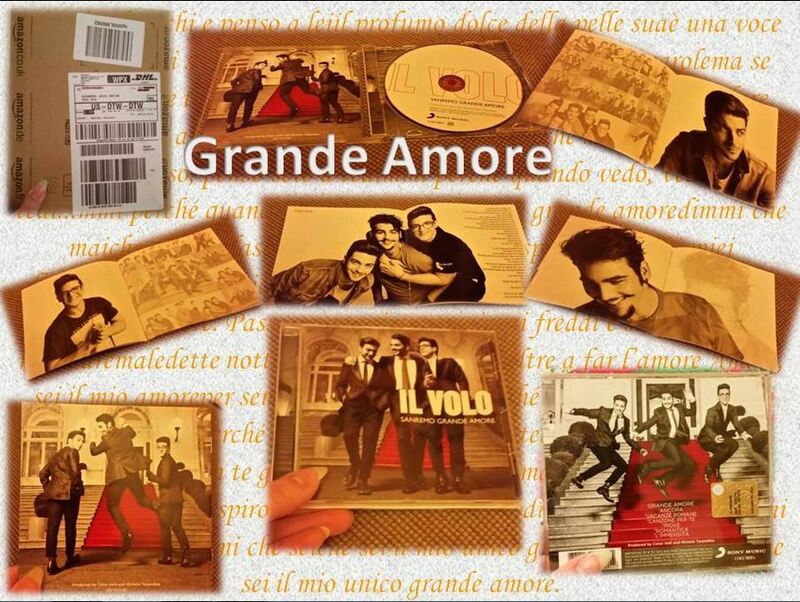 B=Dear Piero, great member of IL VOLO, do you know what this is? It is the “WITHOUT END” trophy, welcome to GIRO D’ITALIA. P = Thank you, thank you, it’s an honor for me and a truly, a living experience. B = I see you almost excited, you who live the great theaters, the great masses, the great moments. P = To know new things is always a pleasure, it is good for everyone. When you phoned me to invite me, I had to free myself from some commitments, but it was really worth it. B = Do we want to say that we are in Agrigento, and therefore at your house? P = Yes, I’m from Naro, a village near here, but Agrigento is my land, I was born and raised here, and I keep coming often. B = Do you love your land a lot? P = I am in love with my land. B = Then Piero, an unpublished day for you, what impression did you have of this GIRO D’ITALIA, now that the cyclists are aligning at the start? P = Definitely I will bring it in my baggage of experiences, I am excited because the GIRO D’ITALIA belongs to everyone, all the riders will not forget this stage and we Sicilians, Agrigentini above all, we will not forget this great experience. Very good Piero, with your presence you have done a great job! Ok, I thought we might all enjoy a little throwback to the Detroit concert last year, just about a year ago… Some fond memories of the guys and good friends. I miss them so, as I’m sure we all do right now. Impatiently awaiting their new album! Enjoy! This year, we didn’t have to wait quite as long as last time. November 29th could not come quick enough though, as soon as we knew when the pre-sale tickets were going on sale. We were all waiting with fingers and credit cards ready at 10:00am EST to get our hands on the best seats we could. Ten AM hit and we were off. Our fingers flying like a tornado, tearing through all the codes, and commands, and “I’m not a robot” games! Then it was sticker shock for Detroit! $450 each! Ok, you only live once and it was front row. So, trying not to think about the price, we took a quick breath of recovery, and painfully punched in our credit card numbers! There, it was done. Our tax returns were coming soon, right? Ok, fast forward – after many months of careful planning, the Detroit Il Volo Girls, were joined by a few out-of-towners for a fantastically planned evening. Most of us met at my place in Dearborn and were whisked off by our contracted driver in a Ford Transit to the original “Antonio’s” called Roman Village in South Dearborn. We had 3:30p reservations, as we did not know what kind of traffic we’d run into. We had a lovely meal and left about 5:30p. Due to the construction on I-75, there was a lot of traffic going south, so we just stayed on the side roads and got there in plenty of time; arriving approximately 5:45p. Thankfully, the box office was open, so we got our tickets from will call. We still had to wait a little bit for them to open the doors. I was anxiously waiting for the arrival of Marie and Leelee. As I was looking out the door, I saw them get out of the taxi! It was so good to see them – I had their front row tickets waiting for them. As soon as they got in the door, they were letting us in the lobby. We went through security, then quickly bought our souvenir t-shirt and little furry bag. Awaiting us in our VIP bag were the Il Volo wintergreen mints, another long, fuzzy, black bag with Il Volo on it, and a deck of cards with their picture on the box, and of course, our signed VIP badge for the night. We were escorted to our seats. I sat on the end in the front row, with a direct view of where Gianluca would be standing. They were only about 5 feet or so from the stage. Our seats were so close, we could touch the stage. We mingled with the others and met up with old friends; making some new friends along the way. It was so great to see so many people you knew and remembered and who remembered you! Before you knew it, it was 7:30p and time to begin. They started pretty much on time. The lights went down on the theatre, and they went up on the stage, a deep blue light created a reminiscent backdrop of the evening sky in Florence. The smoke machine started to create a subtle breeze in the air. A quiet hush fell over the audience as the orchestra members strolled out onto the stage. The crowd clapped politely. Then the maestro, Joseph Modica, came out; again, the crowed clapped. The lights changed from red, to blue, to purple, to teal, and back again, all night. Very similar to the Florence concert, actually. Joseph raised his hands and the first notes of the violins could be heard resounding over the crowd. That song, that most of us had only heard on the CD or TV, was now playing live, right in front of us. The sing-songy violins spoke and the cellos and bass answered back to them. Soon, it was over. The audience cheered and clapped, knowing that what they were really waiting for was about to appear before our eyes. Seconds later, the notte magica truly began. The guys, dressed elegantly in their velveteen jackets, strolled out onto the stage, amidst what would be the first of many standing ovations that night. Ah, it began…. Gianluca with his first note of Nessun Dorman…..his velvet voice caressing our ears and his gorgeous eyes, penetrating our very souls. After their first song, everyone in the first 5 rows stood up and gave them glorious cheers, whoops, and applause! Then came Granada. Ignazio stood with a devilish grin on his face, with his hands tightly clasped behind his back, just waiting, as Piero held that now famous long note. The crowd cheered, and then Ignazio began his part. Soon, it was time for their solos. Ignazio was first with Una Furtiva Lacrima…. To see him sing that with such passion, power, and anguish, was truly an incredible experience. He has such a soft voice when you talk to him. You would never believe something so powerful could escape those lips. Standing ovations from all! More whoops, and cheers! Especially from the first 2 rows! Then came La Danza, with Gianluca. Again, flawlessly executed. How he gets all those notes in there is pure magic, that is for sure! Another standing “O!” Then it was Piero with No Puede Ser, I believe. I have to say, that is one my favorites by him. Piero does seem to always be the crowd favorite with thunderous applause and cheers. Still, Ignazio is my favorite! I was fearful that the concert would be a little on the stiff and boring side, but I was pleasantly surprised, as the guys were joking and laughing in between each song, and fooling around as much as they dared; standing in relatively one spot all night. They did take a few breaks and let the orchestra play. What was also nice was that they would come out to center stage to take a few bows after their songs, so everyone was able to see them. Of course, those of us on the left or right side of the stage, could still not see them well to get any good pictures. However, I was able to get some good shots from my vantage point, although many were close to just profile views. I loved their one little joke about Piero and Ignazio calling their siblings, or in Ignazio’s case, his dog; the others’ names! Piero admitted to sometimes calling his brother and sister Igna or Gian. But then he said it was worse that Igna called his dog, Franz, by THEIR names – Piero, or Gian. Ignazio said, with his cute accent, “it happens….” And I can see how it can, for I called my own cat by my other cat’s name! Comes out Kam-ari (for Kamina and Mari). Lol! When it came to O Sole Mio, Gianluca did a little intro saying that many artists recorded this song and the different versions. He mentioned liking the Elvis version and Ignazio says “ELvis!” in his deep voice, and does a little hip movement. (of course being polite here, but it was pretty slight…) Yep, can’t get away from that one! As mentioned in previous reviews, they did Grande Amore and the awesome new Ave Maria, which Gianluca says was written for them and they want to sing to the Pope one day. It was hauntingly beautiful and amazing to hear them sing it in person, since that was not part of the Florence concert. Our group and the first several rows stood and clapped after every song. All too soon, the notte magica quickly came to an end. In their reprise of Nessun Dorma, the whole theatre was on its feet, with cheers and more thunderous applause! They did not take a break, and it ended just about 9:30pm. Yes, one part of the magical night was over, but we were still anticipating the real finale of the evening where we could touch these angelic creatures with these heavenly voices! Unlike last year, things moved pretty quickly. It was a little confusing at first, but they directed us to the elevator to the 2nd floor. Good, much better than last year. We ended up on the 2nd floor, near the mezzanine area, I believe. It was a nice area and much bigger and better than last year. It was very pretty and a nice open area, overlooking the downstairs lobby. When we got up there, we saw where the guys would be. Shortly, the OMGVIP guy came out and gave us the usual “lecture” but he was very nice and told us how things were going to go. They were very organized and had tables so we could set our belongings on them. Everything was pretty orderly. We waited maybe a little over half an hour. Shortly after 10p or so, out came the guys through the velvet curtains. Before it began, there were like two groups – one to the side and one to the front of where the guys would be. The OMGVIP guy actually said – just come on up here and you guys decide who wants to go next! Wow, that was cool! No pushing, no shoving, etc. There were also nice chairs scattered around the perimeter if you wanted to sit down. Like a total 360 from last year’s cattle call! So, by the time the guys came out, everyone was relaxed. Barbara and Alessandra came out first and we were able to chat with them if we wanted to. Leonora came out also, but then hid back in the wings – I guess she didn’t want to join us that night. Gaetano was on the sidelines as well. It really is nice they all have a family member present. I guess Ignazio figured all he needed was Alessandra on this trip. Vito and Caterina stayed home this tour. Some of you knew I made these scarves for the mothers, Nina, and Barbara. Marie graciously took Caterina’s and Eleonora’s, along with the one for Nina, to them when she visited Sicily. But I still had Leonora’s and Barbara’s left. So, I was able to give the remaining scarves to Barbara and she said she would give the other to Leonora. When I gave the package to Barbara, she saw the crystal wing and her eyes got real big! I gave her the black one. So, I think she liked it, even though she didn’t open it right away. I really should have had her open it, but I didn’t. I also gave each of them a card that had a picture from my Italy trip that I had made on Shutterfly, with a note inside. I did see Barbara open the card and could tell she was reading the note. But, the deed was finally done and they were out of my hands. I got back in line and awaited my turn. Soon, I was next. I had it all planned out. I was going to say each of their names and give them all a big hug, and I had practiced in my head what I was going to say to each one of them! So, here is how it went…. They were in their “almost” usual spots… Gianluca was on the left, Piero in the middle and Ignazio on the right. I went up to Gian and said “Gianluca!” and gave him a big hug. I told him I was in Montepagano last summer and it was beautiful. Next was “Piero!” I told him “sempre perfetto!” Got a smile out of him. “Ignazio!” I hugged him and whispered again that he was always my favorite. I got his “aww….” again in his sweetest little voice. I also handed him the package of M&Ms we had left over from celebrating his birthday last year and told him we celebrated all of their birthdays. Then, again, it was all too soon that I felt that familiar tap on the shoulder to turn around and take the picture. I quickly felt a lot of movement beside me and realized Gian was pushing his way in between me and Piero. Odd? Wait….no, YES, it really DID happen that way this time!!! I guess the 6th time is the charm? I was not nervous at all, it was like they were old friends I had not seen in at least 7 months or so? Lol! I met each of them with open arms and hugs. Then it was time to go home. I think, for the first time, I was actually very pleased and happy with myself on how things turned out. I also said “ciao” to Alessandra and said to her, “I’m sure everyone tells you, you are the luckiest girl in the world.” And she said, “yes…” She is a beautiful girl, even with her glasses on!